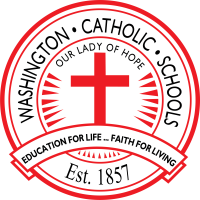 Washington Catholic offers a strong educational program which is accredited by the Indiana Department of Education and is a member of the Indiana Nonpublic Education Association. The curriculum is designed to recognize the needs and differences of individual students, to develop students’ potential in accordance with ability, and to equip graduates to live and find success in today’s complex world. To assist students in recognizing and developing their full potential, students are taught appropriate methodologies, strategies, and current technologies in all areas of the curriculum to solve problems accurately, effectively, and creatively. Students attending Washington Catholic have the opportunity to enroll in a number of dual credit courses. Small class size allows for individual attention to students and the building of close relationships between the experienced faculty and the students. Students graduate well prepared for their future academic and professional pursuits.